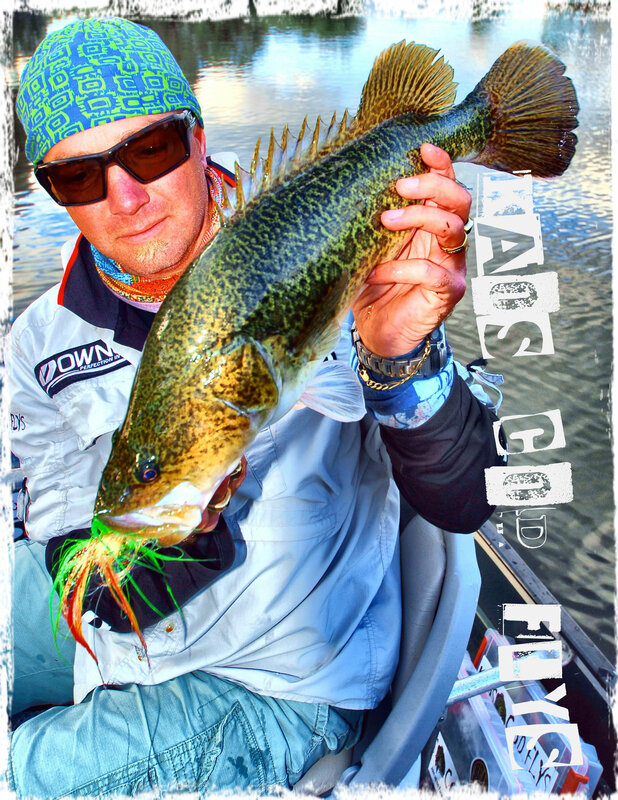 The Holographic Cod Skull is a new edition to the kaos Murray cod fly range! Developing a new fly is exciting; it’s not just a matter of tying a few materials on a hook and throwing in the water system and hoping for the best results!! Profile and colour also sink rate are all key factors when a new fly design is on the books. This colour scheme, size and length of the fly are a result of a hardbody lure on the market today; which I’ve had great success. There are quite a few key points when flies are built! The two main factors to this fly are a weighted head and designing the Owner hooks to swim up right. Constructing the fly to ride hook point up will make it just about weedless and snag proof. Now with 5 new different colours all tied on a 5/0 Owner hook, the Holographic cod skull is the best fast sinking Murray cod fly available right now! It maybe fished with a floating line in the shallows to deep following water with Intermediate line. 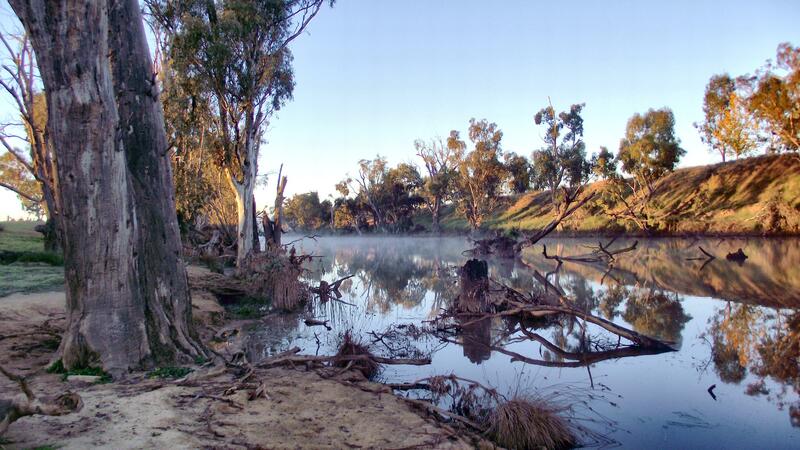 The colours in the range cover all water clarity’s and suited to all rivers, lake and dam systems Australia wide. Cod Deceiver attached with a Rattle Collar! 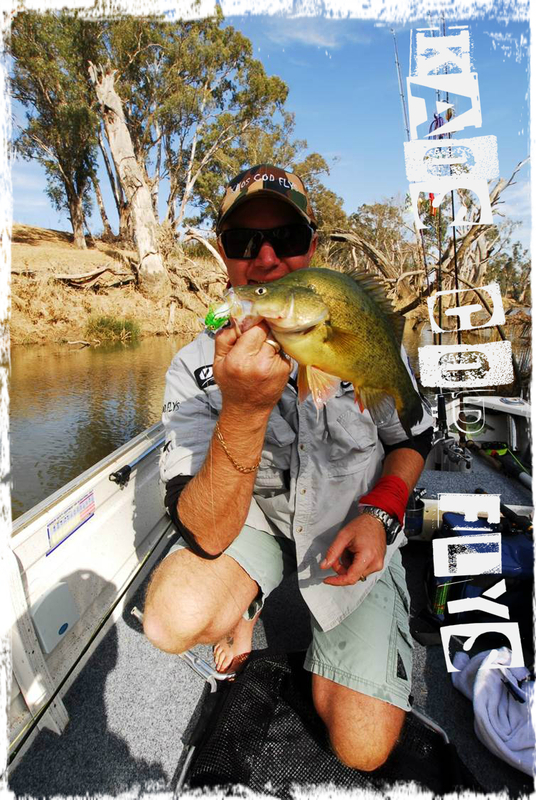 While out the other day targeting Murray cod with good mate Steve, this fly that was intended for cod a small Yellow Belly fell to a cod lolly instead. An old style designed fly; the Lefty Deceiver has been around a-long time and a very effective fly. Cod Deceiver is made up of multiple materials also tied on a 5/0 Owner hook and may even have tied to the shank of the hook a (Rattle Collar). The deceiver is very versatile fly; this also can be fished on 3 different fly class’s floating, intermediate and sinking. Water depth plays a big part on this fly on how it’s fished. Floating lines best cast from the bank while walking and the other 2 lines most effective off the boat but may be used off the bank of any river or lake. Using floating line off the bank reduces the fly from getting hang up or snagged on structure while striping the fly back. Cod Deceiver has a high pulsating action when striped. The fly will slim down to a bait fish profile when striped; but once it’s paused it blows out to its dry natural looking body. A slow to medium sink rate fly and can be cast with a #8 or #10 weight set up it’s just another one to have in your fly box. A Quirky twist – Murray cod A.C.T style! This morning I had the pleasure of fishing with two very proficient anglers Mick and Tom from One Last Cast. The boys fished spinner baits however, I stuck to what I know best and fly fished. 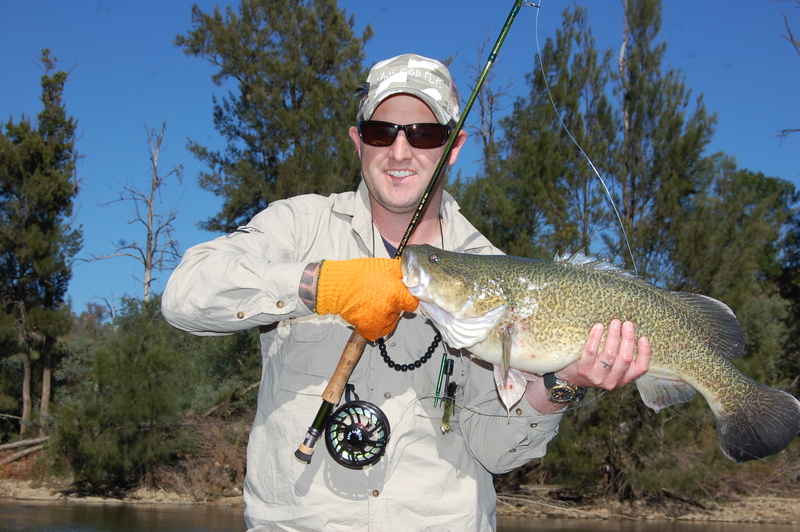 Today the KAOS Cod fly paid dividends with this 66cm cod….Words from Jason Quirk! Fly fishing on any given day is the same as using any other technic or style in fishing. It’s all about presenting fly the right way, by this I mean getting the fly hard up against structure, close to weed beds and fishing drop offs just to name a few.